I’m sure you’ve all heard that watching someone else yawn makes you yawn. I have, and I am certainly a victim to this. However, not everyone participates in the contagious yawn. What separates those who participate in the contagious yawn and those who do not? Psychologists have a theory that your response and participation to others’ yawning is correlated with how nice of a person you are. The word that psychologists often connect with yawning is empathy. Empathy, by definition, is the ability to understand and connect with others’ emotional states. Empathy is a part of cognitive development that each child is supposed to attain as they grow up. Their environment and genetics play a significant factor in the exposure to empathy attainment. Psychology Today reported that a 2010 study from the University of Connecticut found that most children aren’t vulnerable to contagious yawning until they’re approximately four years old, which is said to be because the toddlers have not understood the concept of empathy yet. According to Josh Clark, Leeds University in England conducted a study involving eighty students. Each person was instructed to sit by themselves in a waiting room, along with a disguised assistant who yawned in order to receive responses from the individuals. The students were then given a test showing various images of eyes and asked what emotion each image exhibited. The eighty students were split in half – half psychology majors, half engineering majors. The hypothesis was that the psychology students would yawn more than the engineering students because their profession encourages empathy and emphasizes understanding others’ emotions. The study showed that the psychology students yawned contagiously an average of 5.5 times in the waiting room and scored 28 out of 40 on the emotional test (70%). The engineering students, who were predicted to score lower because of the personality traits associated with those who excel in science and mathematics, yawned an average of 1.5 times and scored 25.5 out of 40 on the following test (approximately 63%). One could argue that 25.5 opposed to 28 does not make a significant difference, but it must be noted that the emotional test has potential for factors of error. 5.5 in comparison to 1.5 is a substantial difference. One thing I found intriguing about this study was that women were not reported to be more empathetic than men, which you would expect because the typical stereotype of women is to be caring, nurturing, etc. In 2008, The University of London also conducted a study on this theory, but used dogs rather than humans. The simple fact that a dog is a man’s best friend convinced Ramiro Joly-Mascheroni that a dog was the perfect player in displaying empathy. The results? 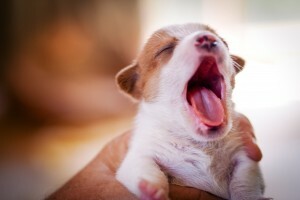 Human yawning made 21 out of 29 dogs, or 72%, yawn in response. It was reported that none of the dogs yawned in the control condition. So, as it stands, this study along with many others claim that yawning is correlated with how nice of a person, or being in general you are. Stay tuned for my next blog which will explore the null hypothesis stating that yawning and empathy have nothing to do with each other. This entry was posted in Uncategorized and tagged contagious, dog, engineering, nice, psychology, yawn, yawning on November 9, 2014 by Briana Blackwell. What makes yawning so contagious? This post is about humans, but I couldn’t help uploading this picture. Just look at the puppy, it’s so cute! Anyway, I’ve grown up being told that yawning is contagious. I’ve always found this to be quite interesting. Most people are under the impression that yawning is contagious for reasons such as empathy, energy levels, or tiredness. Well, a new study from Duke University suggests that this isn’t the case at all. This is the most comprehensive study about contagious yawning to date. The study involved taking 328 healthy volunteers and having them complete cognitive testing, a demographic survey, and a comprehensive questionnaire that measured empathy, energy levels, and sleepiness. Then they watched a three minute video of people yawning and recorded how many times it made them yawn (Duke Medicine para. 8). Of the 328 people studied, 222 contagiously yawned at least once, and the participants that did yawned between one and 15 times during the video (Duke Medicine para. 10). So if it wasn’t empathy, energy levels, or tiredness, what was it that made these people contagiously yawn? Researchers found that the only independent factor that significantly influenced contagious yawning was age. As their age increased, participants were less likely to yawn at the video (Duke Medicine para. 11). Study author Elizabeth Cirulli, Ph.D., assistant professor of medicine at the Center for Human Genome Variation at Duke University School of Medicine, elaborates, “Age was the most important predictor of contagious yawning, and even age was not that important. The vast majority of variation in the contagious yawning response was just not explained” (Duke Medicine para. 12). Even after conducting this extensive study, contagious yawning still largely remains a mystery to scientists. At least now they have age as a hint or stepping stone to work off of. It’s amazing to me that something so simple can still remain so inexplicable. In my opinion, this experiment was well-executed. The conductors of the study were sure to get a diverse group of volunteers. If they had not done this, it might not have been possible to discover age as a factor. Reverse causation was not a possibility in this experiment because the video can cause participants to yawn, but the participants’ yawning cannot do anything to the video. If these results are incorrect and age is not a factor, it would be a false negative. Duke Medicine News and Communications. “Contagious Yawning May Not Be Linked to Empathy; Still Largely Unexplained.” Duke Medicine. N.p., 14 Mar. 2014. Web. 22 Oct. 2014. <http://corporate.dukemedicine.org/news_and_publications/news_office/news/contagious-yawning-may-not-be-linked-to-empathy-still-largely-unexplained>. This entry was posted in Uncategorized and tagged contagious, yawning on October 22, 2014 by Macy Cellitti.